Let Us Help You Find The Perfect Door! What does your door say about you? Are you someone who values an elegant entryway, or is functionality your main priority? 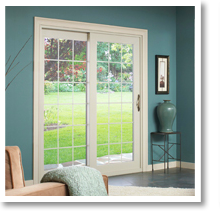 No matter your reasons for needing a replacement door, Window World of Wichita can help. Window World’s replacement doors are made with durable materials that keep comfortable air in and unwanted elements out. In Wichita, we know a thing or two about severe weather. We realize that doors need to be strong enough to insulate your home when the weather turns sour. We offer customization through styles that go well with any interior or exterior plan. We recognize that color is important when picking a door, as it is the first thing your guests see as they approach your house. If you really want to make your door unique, we carry a variety of door knob and handle styles to accent your living space. A service that we are proud to offer is our free in-home estimate. All Wichita and nearby-area homeowners can experience this service, with no obligation. We know how frustrating it can be to pick a new door, which is why we offer our opinion and assistance at no charge to you. Browse our replacement door selection below for inspiration! All of our doors are constructed of quality materials that will last for years to come. 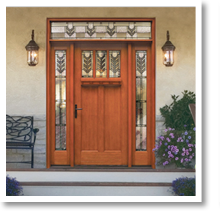 Make your entryway the envy of the neighborhood with our many entry door collections and window styles. These beautifully-designed doors add style to your exterior and will keep undesirable exterior elements outside where they belong. Crafted with beautiful form and function, sliding patio doors come in three styles: French, Contemporary, and Classic. Sliding patio doors are constructed with a heavy mainframe, yet they slide with ease. 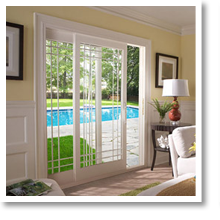 Hinged and French patio doors are two of the most elegant additions you can make to your living space. The large glass panelling allows maximum natural light to fill the room, creating a more relaxing area. 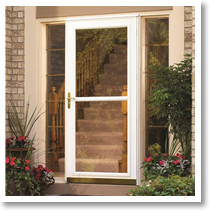 If you want the light and fresh air from outside, but don’t want bugs or bad weather getting through, then storm doors are your best option. Designed to be strong enough to keep out severe weather, this option will afford you the best of both worlds. Who says garage doors can’t be beautiful? 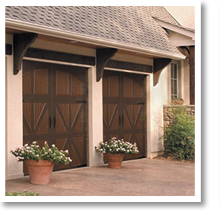 Not only do we have garage door options to enhance your exterior, but these doors can be properly insulated to keep your garage feeling comfortable. Contact Window World of Wichita to get your replacement door project started. Local experts are ready to assist you with any replacement door questions you may have. We look forward to hearing from you!